Everything about London is different. It always was and it always will be. It’s one of the liveliest, busiest cities on Earth. London is not just a British city, it’s a global city and we thought it was about time London got its own coffee, a signature blend for the capital. LONDINIUM Coffee was created by Greenbean Coffee Roasters, specifically to suit the capital’s tastes and to work perfectly with London’s water supply. It has taken Greenbean Coffee Roasters four years of tasting, talking and testing to develop LONDINIUM and we think you’ll be delighted with the result. We talked to baristas, we talked to coffee shop owners, we talked to customers. We listened. We learned. We started tasting and testing beans and blends and building up a flavour profile with enough character and depth to delight even the choosiest London palate. We eventually were satisfied when we created LONDINIUM. 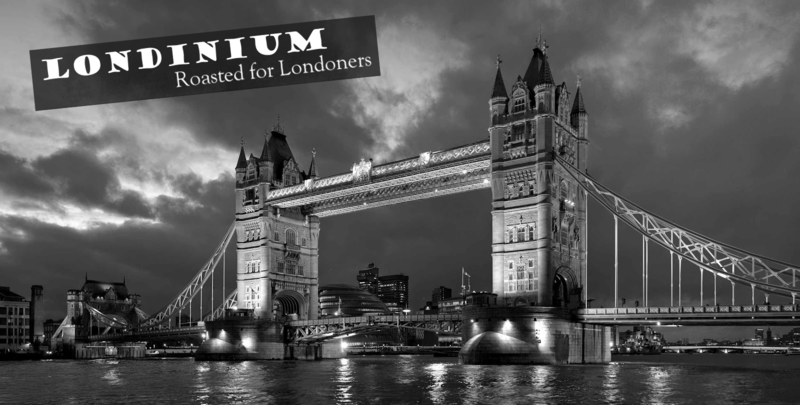 LONDINIUM is a sophisticated blend with several key components. Top quality estate Brazils are the mainstay of the flavour profile and the aroma. Fine Brazilian Arabicas give the coffee much of its richness and the suggestion of chocolate that underpins the primary flavour note. Additional complexity is added by a premium Java which we roast slowly at a slightly lower temperature to bring out its smoothness and fruity accents, while avoiding the risk of oiliness that a hotter roast could bring. The taste profile is rounded out with carefully selected Colombian and Nicaraguan beans to add brightness and bite to the blend. This is a sophisticated blend created for real coffee lovers so it’s relatively high in caffeine with a long finish. The blend is bright with a pleasing acidity but absolutely no bitterness. It is closely matched to the taste profile of London’s relatively hard drinking water and the acidity in the Nicaraguan beans (in particular) cuts through the slight flatness of the limestone in London’s excellent water supply. For the first time, we have created a coffee specifically for London, a signature blend for the entire capital. Are you looking forward to trying it?